The earliest settlers anxiously awaited the mail to learn the news from home. Before the train was extended through McHenry County, someone would travel down to Elgin and bring the mail back to Crystal Lake. The first post office was established in Crystal Lake in 1838, with Beman Crandall serving as postmaster until about 1848. Citizens would go to the post office to collect their mail and post their letters. Rural mail service started in 1902. 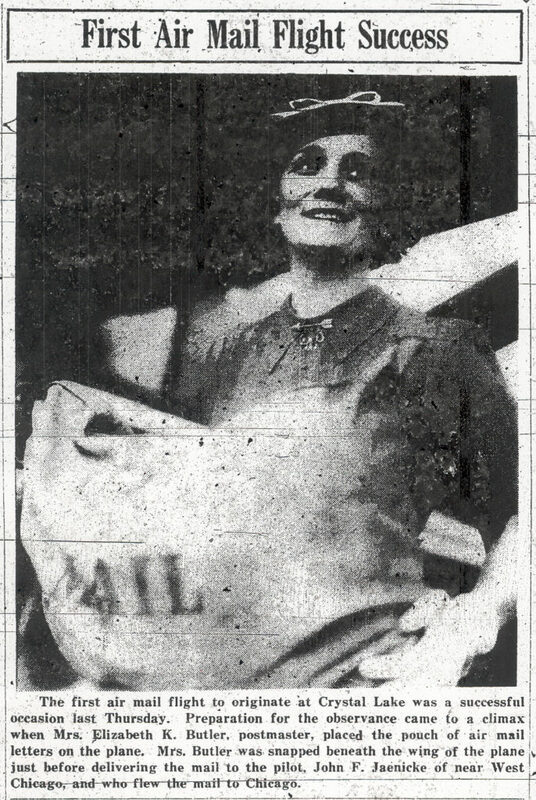 Mail delivery in the town limits began in the 1920s. At that time, a numbering system was developed, and addresses were assigned. Learn more about early mail delivery in Crystal Lake. The address numbering system was changed again in the 1950s. The first air mail flight originating at Crystal Lake took off at 4:45PM on Thursday, May 19, 1938 from Ebel’s Field. Where was Ebel’s field? The Ebel family owned a large farm situated between Crystal Lake, Cary and Algonquin.